This is a quick tutorial to explain how to restrict mouse movements outside a desired window. 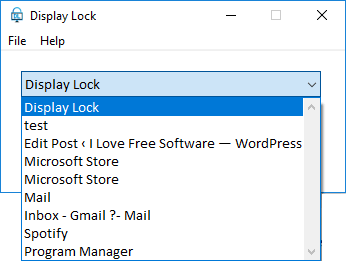 Display Lock is a free software for Windows that lets you lock cursor in the desired window when it currently focused. While the software is running, the cursor will never leave the window on which you have locked it. And it will only work when the target window has focus. Otherwise it will work like normal on other windows and on desktop. You can disable it anytime in one click and by a hotkey. Display Lock is useful software where you want the mouse cursor not leave the boundaries of the current window. Also, it is helpful when you are using mouse clicker software. It automatically creates the list of all opened windows and you can bind it with the any window you like. After locking the cursor with a window, you can minimize it and keep doing your work. How to Restrict Mouse Movements Outside a Desired Window? Display Lock is an open source software that you can use to restrict mouse movements outside a desired window. There is a similar software that can limit mouse movement to specific desktop area. But this software is a bit advanced as it can take a target window and allows mouse movement inside that window only. Using this software is very simple. Here is how to use this. Step 1: Get this software from here and then open it up. You will find its main interface like this snapshot. Step 2: Select the desired windows from the list and then activate the software by clicking on the “Start” button. After the software has activated, you will see the similar behavior that I have shown in the beginning of this tutorial (GIF). This is how you can easily restrict mouse movements outside a desired window. 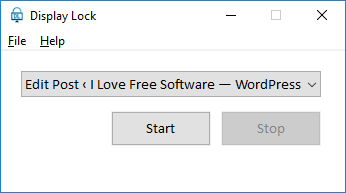 And Display Lock freeware makes it very easy to do that. Just select a target window from the list and lock mouse cursor inside it. And when you want to disable it, just click on the “Stop” button. Display Lock is a unique and free software that you can use to easily restrict mouse movements outside a window. And the software is very powerful to do that. As long it is enabled, it will keep the mouse cursor locked inside a desired application.